With installations in virtually every industry, spanning from steel and aluminum plants to plastic bottles and pharmaceutical products, no challenge is too big or too small for Amerden. Safety is a critical component of any AGV system. All AGV systems delivered by Amerden will be compliant with ANSI/ITSDF B56.5-2012, Safety Standard for Driverless, Automatic Guided Industrial Vehicles and Automated Functions of Manned Industrial Vehicles. 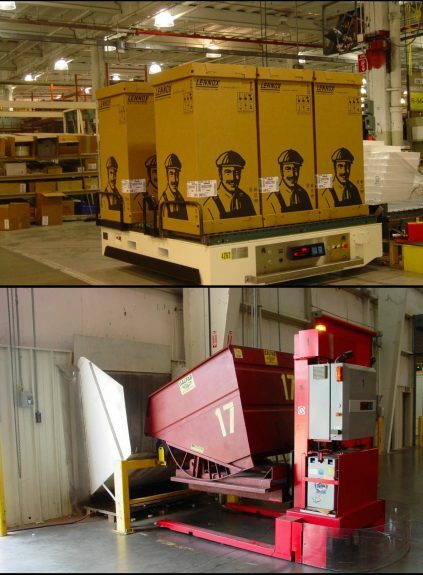 Amerden has a proven approach to the design and delivery of an AGV system. Once the material transport requirements are fully developed, Amerden will design a system that delivers exactly the material handling, transport, and software functionality required. We provide cost effective solutions for the most challenging load handling and operational requirements. After commissioning Amerden is committed to long-term support of your AGV System to insure efficient daily operations and high system availability. The heart of every Automatic Guided Vehicle is the vehicle control system. Amerden will select the best and most economical control system for the application, then configure and program the controls to deliver the required functionality. As the AGV components inevitably reach the end of their useful life ourÂ team are able to provide straightforward upgrades for equipment and software. The AGV off-board control system, a.k.a AGV System Manager, provides functions such as AGV fleet management, route optimization, order management, operating reports, interfaces to external customer computer and PLC controls system.